'Yeh Hai Mohabbatein' received the favourite family award, which was handed to them by actress Parineeti Chopra. ‘Yeh Hai Mohabbatein’ received the favourite family award, which was handed to them by actress Parineeti Chopra. New shows ‘Yeh Hai Mohabbatein’ and ‘Mahabharat’ were big winners at this year’s edition of Star Parivaar Awards, bagging six and four awards respectively. Ekta Kapoor’s six-month-old show ‘Yeh Hai Mohabbatein’, a love story of a Tamilian girl and Punjabi boy, won the award in the favourite ‘naya sadasya’ female and male category for Divyanka Tripathy and Karan Patel. The two also received the ‘favourite jodi’ (national and international) awards. The event saw a performance from children from Shiamak Davar’s Victory arts Foundation who paid tribute to Aamir Khan‘s show ‘Satyameva Jayate’. The 49-year-old actor was honoured for his contribution to social causes but since he does not accept awards, he was instead given a packet of sweets. “This show is very important for our society. But it is not just me. It is my team who does all the work, director Satyajit Bhatkal and co-director Swati Chakraborty. Thank you Star for giving me the opportunity to do this show. 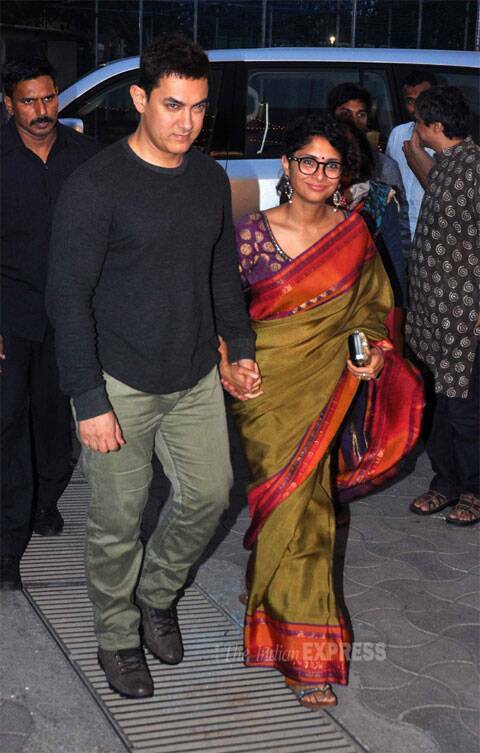 I feel very happy when I see so many changes in th society and in people’s life because of this show,” Aamir Khan said. Mythological TV series ‘Mahabharat’, which has become a big TRP churner for the channel, won four awards including favourite ‘naya sadasya’ (Shaheer Sheikh as Arjun), ‘nayi soch’ award for (Saurabh Raj Jain as Krishna), ‘saathi nayi soch ka’ award (Aham Sharma as Karna) and best ‘kutumb’. the magician’s role and introduced the leading ladies of various shows through magic tricks. He was joined by his co-host comedian Bharti, who arrived in a box accompanied by seven dwarfs. Bharti kept the audiences entertained throughout with her comedic antics, which also left Aamir and his director-wife Kiran Rao in splits. Bollywood actor Shreyas Talpade bagged the best host honour along with Sunil Grover for Big Star Entertainment Awards. The function saw unique and innovative performances by TV actors and international professionals. Digangana Suryavanshi, best known for playing Veera in the show of the same name and Shivin Narang, who plays her brother on the soap, teamed up with skaters for their performance. The duo also won the favourite ‘beti and beta’ awards, respectively. Actors Ritwik, Asha, Karan and Diwyanka shared the stage with international performers for their aerial act. ‘Diya aur Bati’ bagged four awards including favourite husband, favourite son (Anas Rashid as Sooraj), favourite daughter-in-law (Deepika Singh as Sandhya), favourite mother-in-law (Neelu Vaghle) and favourite ‘mazedar sadsya’ (Kanika Maheshwari). Other prominent winners were Sanjeeda Sheikh (stylish female), Vatsal Seth (Stylish male), Heena Khan (favourite mother), Nitesh Pandey (favourite father-in-law), Rucha Hasabnis (favourite sister) among others. Star Parivaar Awards will air on Star Plus this Sunday.